Comments: Big brown bats may be the most common bat in Kansas. They have soft, brown fur with a naked face and ears. Females bear 1-2 young in late May or early June. Several hundred may gather in maternity colonies located in barns, bridges and attics, walls and chimneys of old buildings. They hibernate in caves, rock crevices, mines, and buildings. 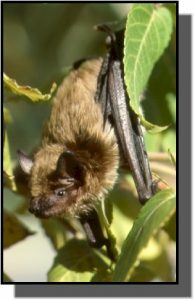 Big brown bats forage over water, forest edges and fields from dusk to midnight. They drink by scooping sips of water while flying. They may live up to 19 years in the wild. Distribution: Big brown bats range from southern Central America into Canada. They are found throughout Kansas in nearly every habitat. Food: Big brown bats consume approximately a third of their weight each night while feeding on insects, primarily beetles.